Give Plant a try! 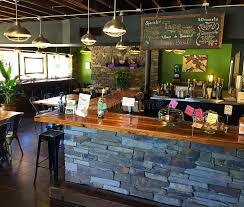 Our amazing all-vegan restaurant in Asheville. Almost every day here at the Wildberry Lodge we are asked for restaurant recommendations. Anyone who knows even a scintilla of information about Asheville knows beyond a shadow of a doubt that we are the place that caters to all you foodies out there. We have so many options that it’s easy to get lost in the myriad of choices available. I have covered and reviewed many restaurants in the Asheville area in this blog. Eateries that satisfy your olfactory senses and leave your belly filled to the brim with satisfaction. I recently realized, however, how many vegetarians and vegans we have as guests at the lodge and it dawned on me that not once have I showcased one of our most celebrated restaurants that provide an all-vegan menu! What have I been thinking? I got to represent all the vegetarians out there! Allow me to shed some angelic light on a fabulous restaurant called Plant. Plant is an all-vegan, organic and local focused, mostly gluten free restaurant. They create their recipes mostly from scratch and use only 4 oils for their creations; extra virgin olive oil, toasted sesame oil, sunflower oil and coconut oil. 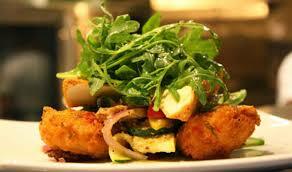 They strive to deliver food in an environmentally friendly and health conscience way. Just because you are eating out more while on vacations doesn’t mean you have to feel guilty about it! Eating here is a perfect option for people who value bold flavors AND eating in a healthful manner! Some of the highlights on their thoughtful and well-designed menu are the Potatoes with Italian salsa verde, chamomile shallot butter and smoked maldon salt. They also offer an amazing curry which I have tried and tasted like heaven! It is Green Curry with togarashi tofu, bok choy and red pepper, sesame cabbage and pickled shitake over green chile rice! Yum! All the wines utilize sustainable, organic and bio-dynamic methods as well. They offer local brews only made in Asheville and a cozy selection of fine spirits and herbal themed cocktails. If you have an Asheville Food Bucket List like I do then this one is definitely for the books! The location is rather intimate and romantic in a quiet setting with dimmed lighting. Most of the time reservations are not needed throughout the week but they are recommended on the weekends. This entry was posted in Food and Drink, Restaurants and tagged Asheville, plant, restaurants, vegan, vegetarian food, where to eat, wildberry by admin. Bookmark the permalink.